I call this the "Little Buddy" card. 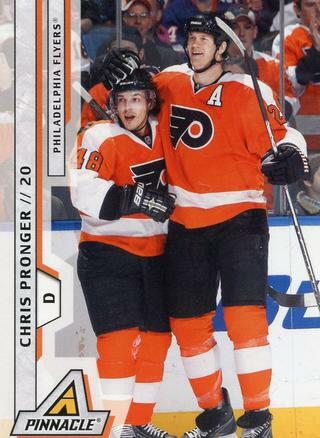 6'6" Pronger towering over the diminutive Danny Briere. Awesome! 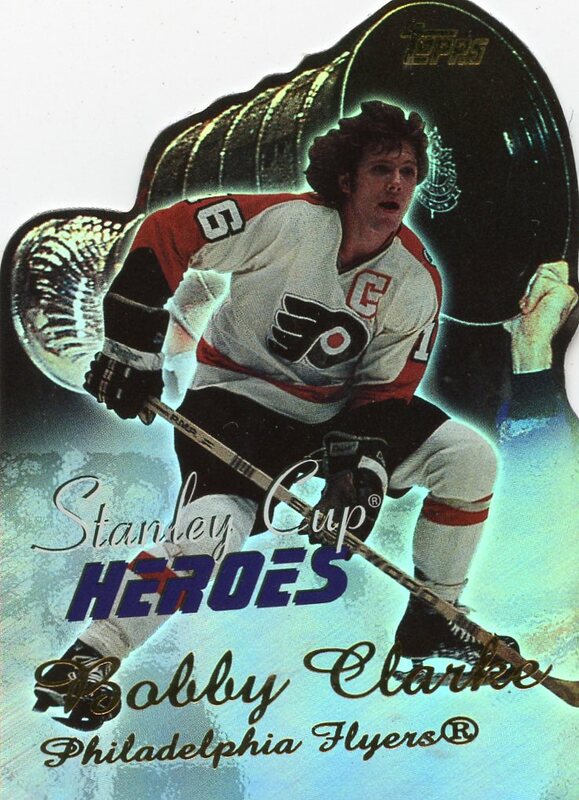 Below is a random view of Flyers hockey cards over the years. Great card saluting all of sports longest undefeated string. The streak bested the 71-72 Lakers 33 game winning streak. The streak began in October and saw the Flyers win 25, and tie another 10 games. Incredible. 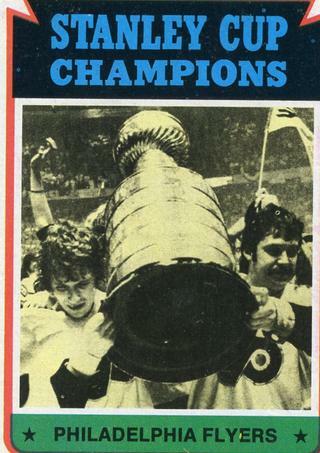 First of two consecutive cups won by the Flyers, beating the big, bad Bruins. 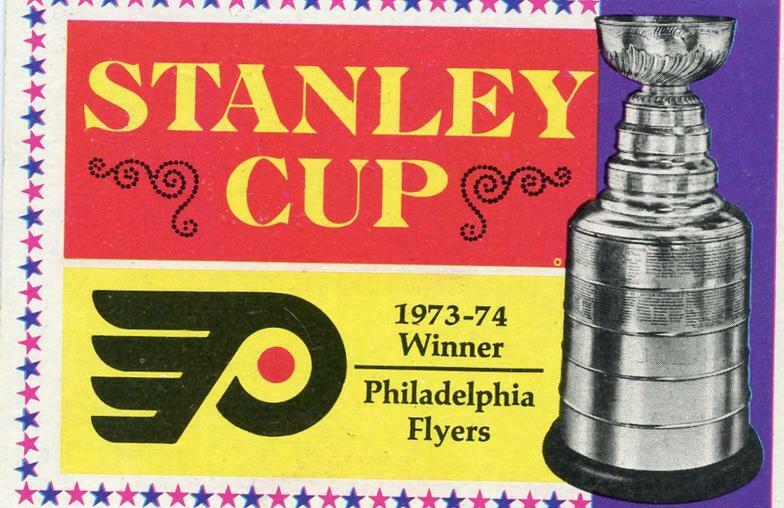 The Flyers have since lost 4 times going to the finals. 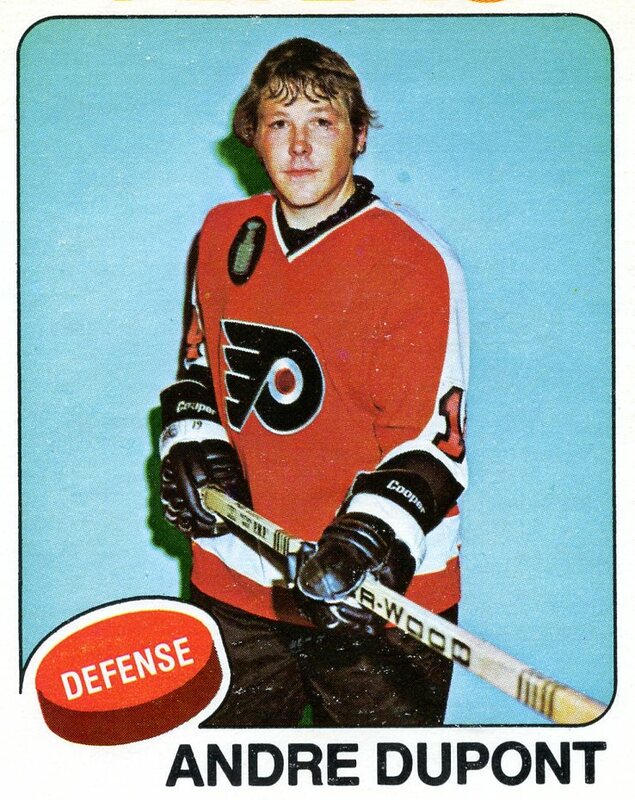 Big, lanky Don Saleski was a very popular Flyers. 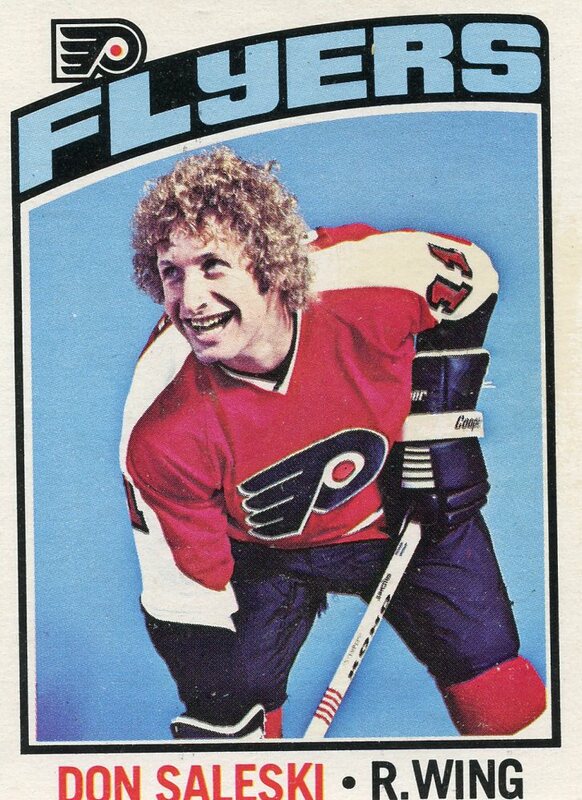 His height and curly hair earned him the nickname "Big Bird". 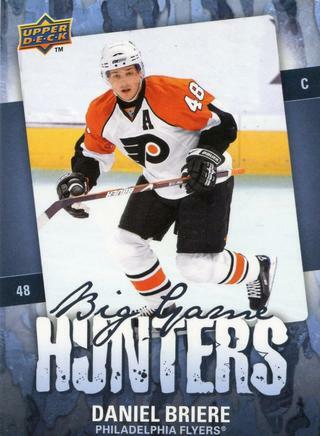 While we're talking about Briere, the appropriately named "Big Game Hunter" card. Briere has 72 points in 68 playoff games, and had 30 in the 2010 Stanley Cup run losing to the Blackhawks. 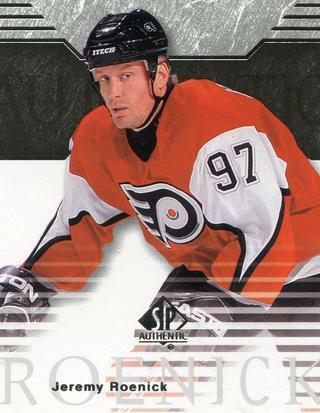 We only had Jeremy Roenick here for a few years, but his spirit and effort was tireless. One of the all time leaders in many statistical categories for American born players. This is a rare pose for Roenick, he has his mouth shut. The famous Legion of Doom card. In their heyday, impossible to get the puck from them. 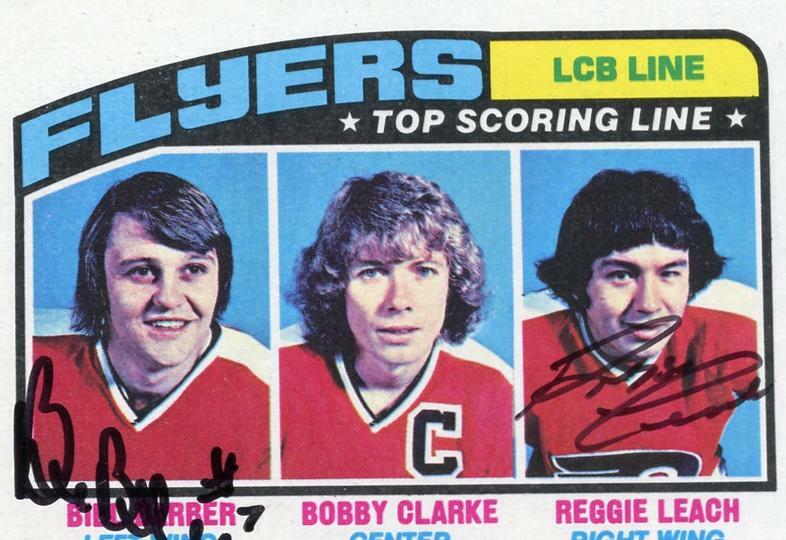 They were a nightmare for undersized defensemen. Literally made it look like the 12 graders against the 7th graders on the ice. 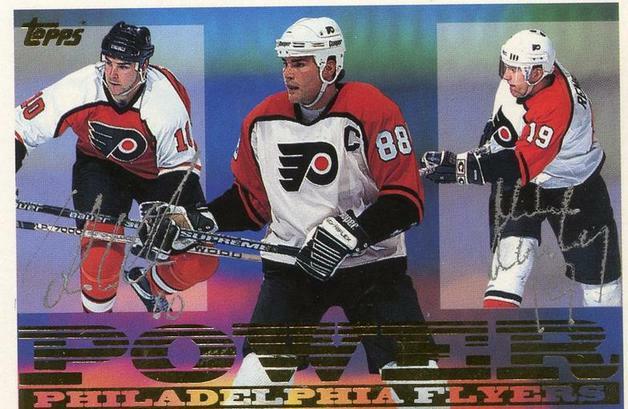 Lindros and LeClair reunited on the ice at the Winter classic to score a goal to give the fans a great feeling. Our hero, with the hardware. An icon for perserverence and determination. 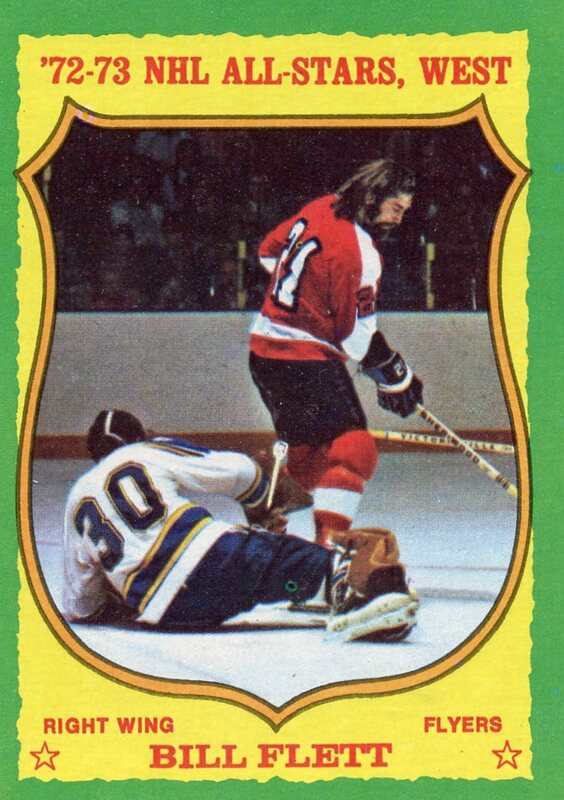 Another loyal foot soldier frequently found in the crease. 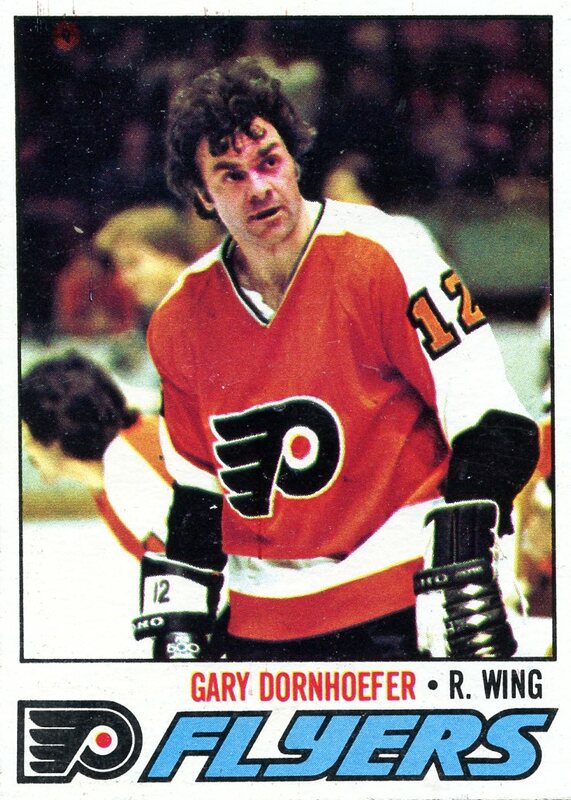 Gary now a PR man for the Flyers and can be found on the concourse at home games. Tough and big. Fun to watch. On the rare occasion he would score a goal, he would do the "Moose Shuffle". Cowboy Bill Flett. 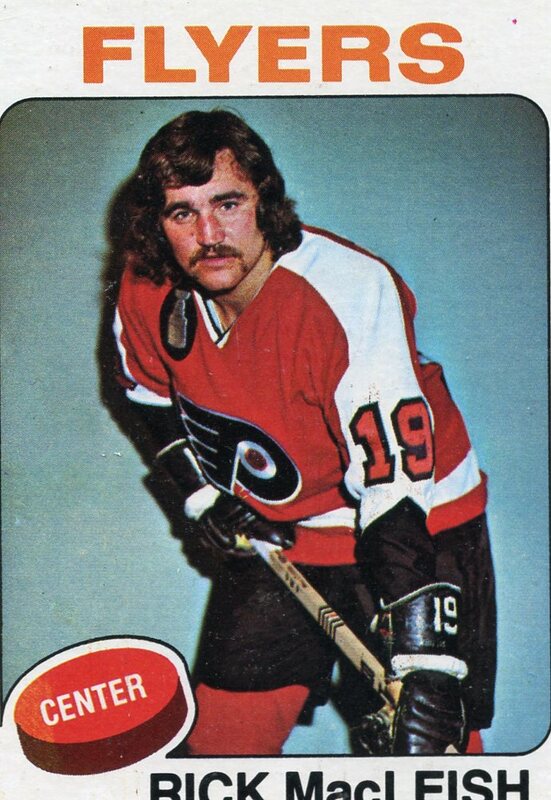 The beard helped the lawless image of the Flyers. Tough and strong. Sadly Bill died too young. Another big leader for the Cup winners. Famous for his role against the Russians. The "Rifle". Clarke said he could. And he did. 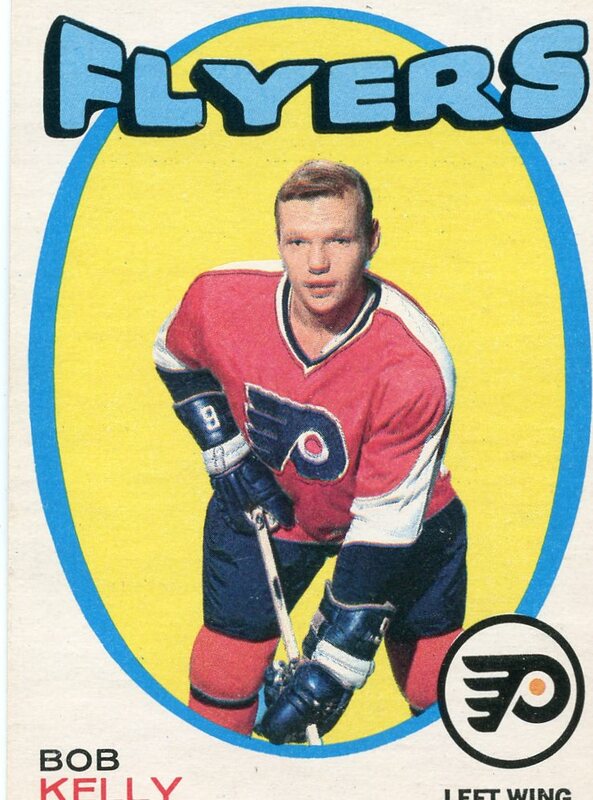 His single season record for a Flyers foward for goals still stands. Can Gagne take possession of this record? Stay tuned. 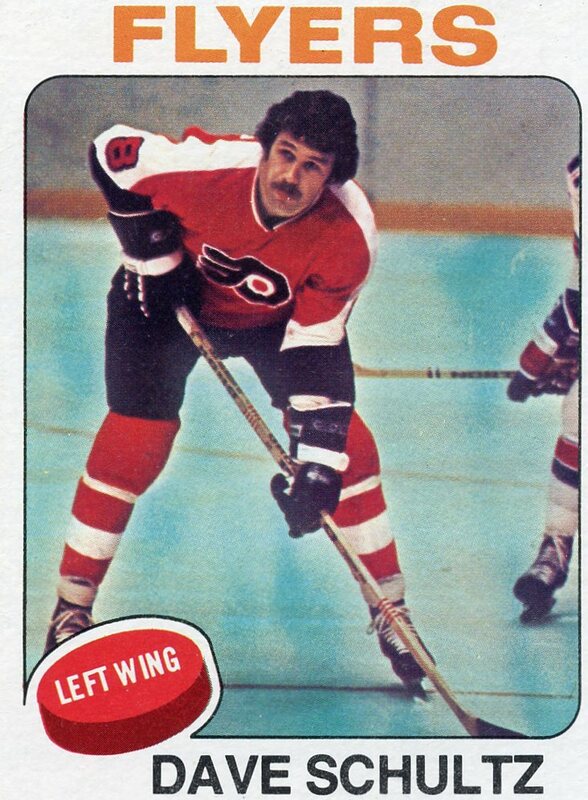 The best defenseman the Flyers ever had. The year he played with the Beast they were incredible. Most nights the fastest player on the ice. Recently elected to the Hall of Fame. 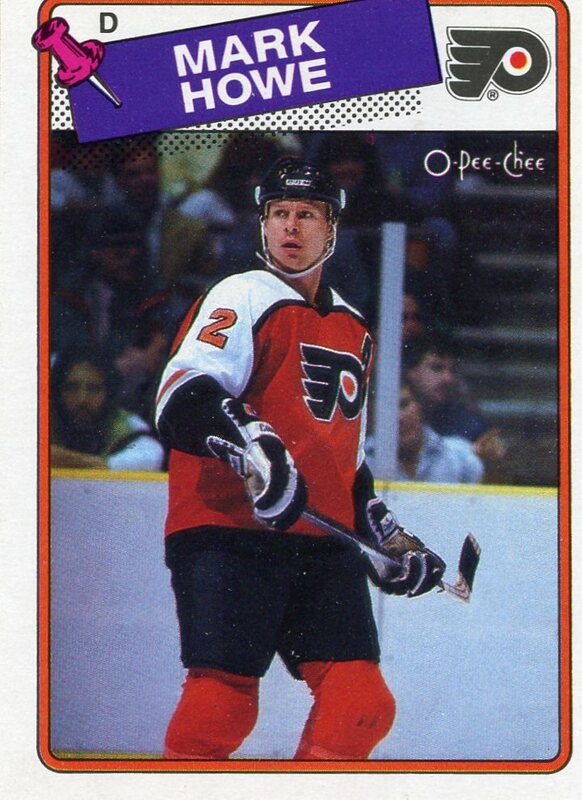 Drafted way back in 1998, he became a top all time offensive performer for the Flyers. Went on to win a cup while with the LA Kings. 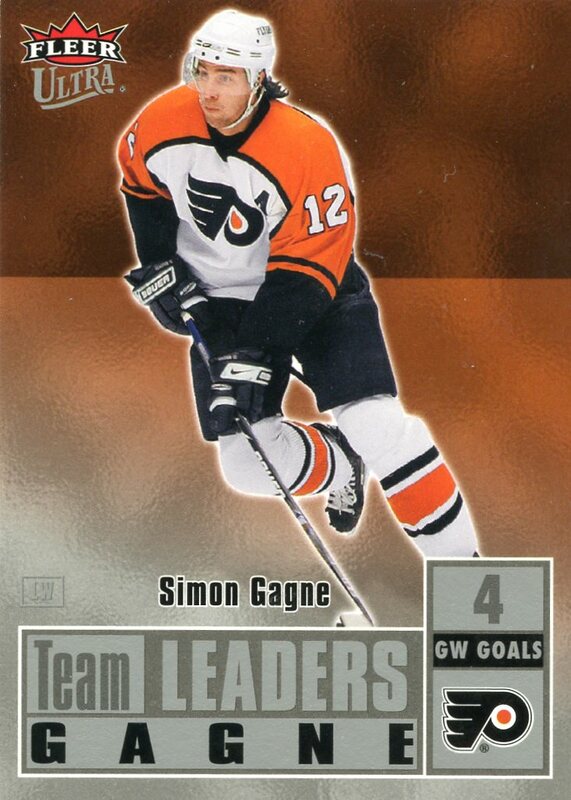 Flyers fans will have many memories of Gagne, but who will ever forget the game 7 goal against the Bruins completing the come back from being down 3-0. 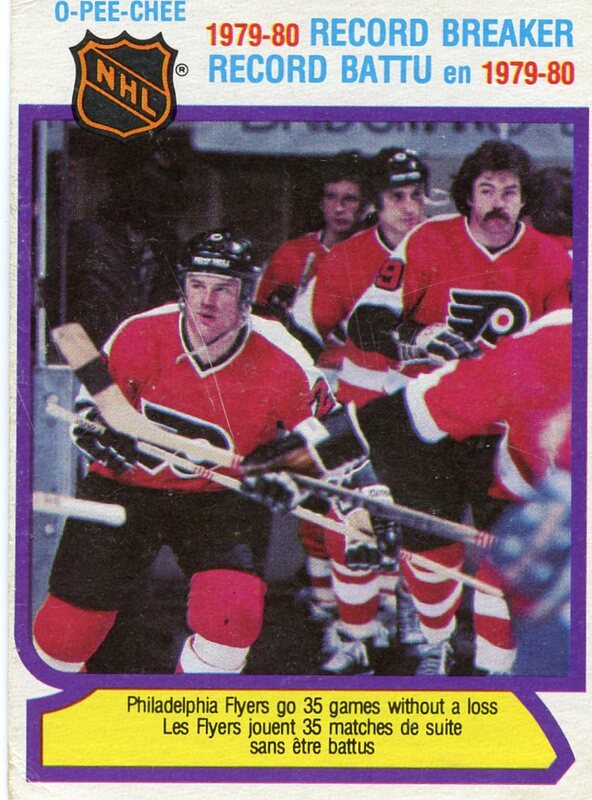 Another top offensive weapon for the Flyers of the 1980's. Scored 54+ goals 4 straight years. Won the Bill Masterton trophy in 1989 for perseverance and sportsmanship. Intimidation help the Flyers win their Stanley Cups. Here's our poster boy. The Hound. Played inspired minutes hitting everything on the ice. 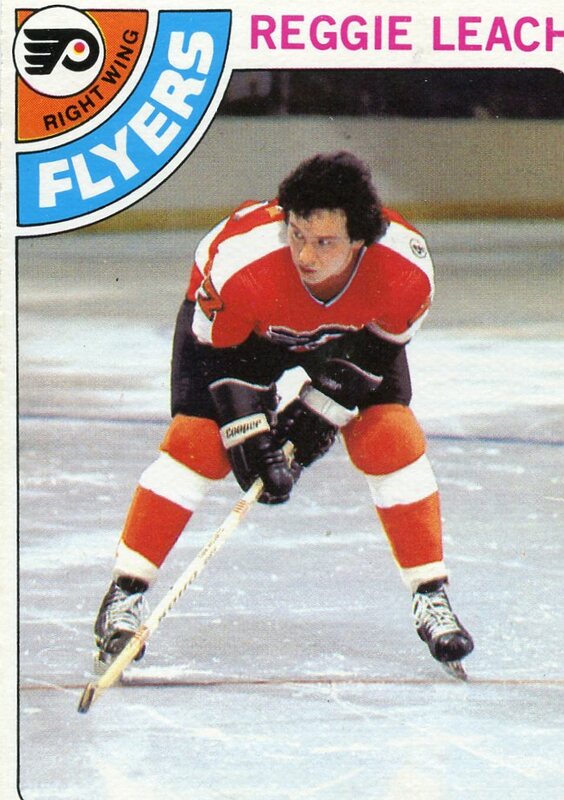 Still around as an embassador for the Flyers. Can always catch him at games by the season ticket table. Rick scored 50 goals and 50 assists in his first full NHL season. 1 year later scored the only goal in the clinching game of the Stanley Cup finals against the Bruins. 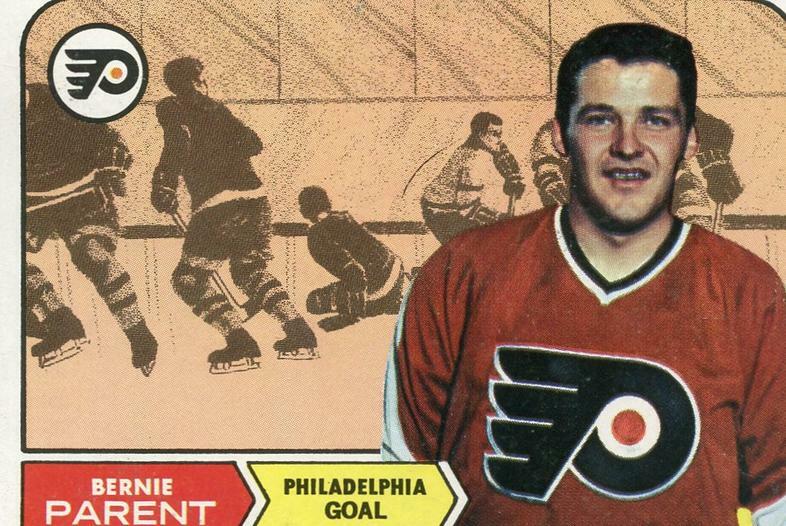 Bernie Parent's rookie card. In the odd event that the opponent got a shot on goal, Bernie stopped it. 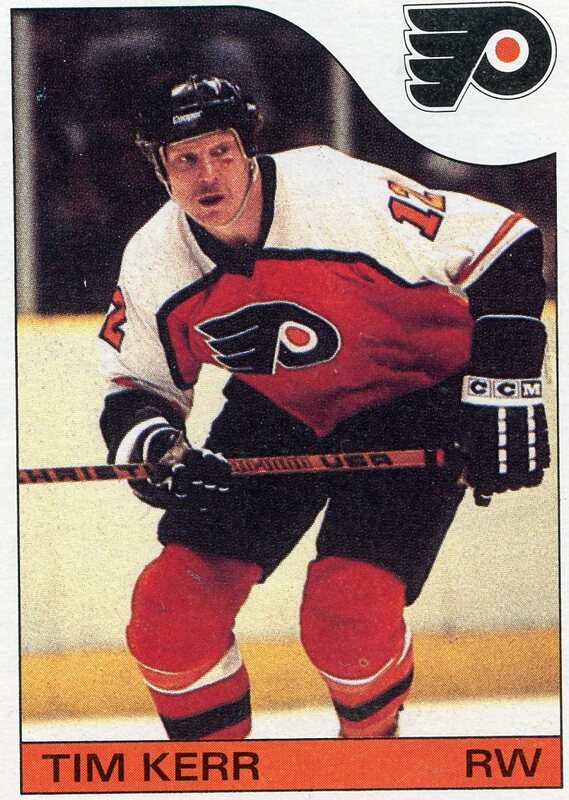 If the Flyers were in the penaly box, Bernie stopped it. The ultimate team player and soldier. The L-C-B. New comer Leach joined Clarke and Barber. 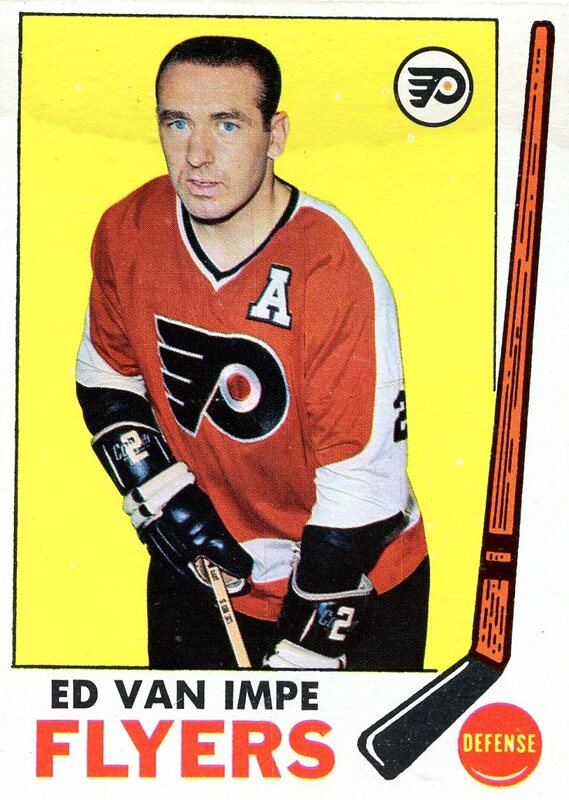 Set a NHL record by a line for goals (141) and help the Flyers win their second Stanley Cup their first year together.